One of the keys for me personally is trying to keep clutter low (I go through and get rid of when I notice things accumulating. Sometimes a kid helps and sometimes no.) Another trick has been having enough storage and it organized in a way that it is simple to put things away. Part of that for me is NOT having cupboard doors. When I have doors I hide things behind them which means mess lurking where I don’t want to deal with it. My kids are the same way so we use the cupboards below the counter minimally other wise they turn into insta-traps. I have this whole out of site out of mind thing that is kind of irritating– if I can’t see it regularly and store it in my brain that that is where it is I forget and can’t find it. And being the person that everyone looks to when they can’t find something I need to know where things are and remember where I last saw it. Instead of trying to make things beautiful we aim for convenient and neat looking. When I make changes I discuss them with the family (you wouldn’t believe the grief I got for MONTHS for changing the silverware drawer without discussion). We don’t have a lot of spare change for organizing things so I use things I find on clearance (like the baskets in the other photos), at the thrift shop, or things that are free like the clementine boxes that are my spice racks. Another view of our dish and tea cupboard. We have a shelf on the counter as it is easier for the kids to put dishes away if they can reach. Our dishes are all mismatched sets and most of them are ones Rachel bought me for my birthday or ones given to us by a friend. I have a thing for square plates and rice bowls so we have an eclectic mix of those. Also we each have favorite types of coffee/tea cups so those all hang even though we don’t need so many (no one is willing to give up their favorites. : )) The jar set on the second shelf was made by my grandfather and is kind of tricky since some of the lids don’t fit perfectly and fall off at random– this would be why they are sitting straight up instead of at an angle. Nothing like nearly being clonked on the head with a large wooden and porcelain lid. The front pantry is an old metal medicine cupboard that was my grandparents. The basket on top is full of our daily supplements, the little cups to the right are tomorrows vitamins for the family, the red overnight suitcase is our medicine cabinet of various herbal remedies and the brown basket below is full of herbal cough drops for the cold that has been circulating our family. This cabinet has whatever is in use daily– nuts, dried fruit, homemade grain free granola, and chocolate. Our homemade back pantry. Growing up my grandparents and my parents both had an awesome walk in pantry and I have been wanting one for forever. I finally took the metal shelves from the girls room and made a red-neck version so I have a place to store all our teas,orders from Amazon, my milk run cooler, empty jars, kombucha, and other ferments. The baskets on top of the fridge have Shamus’ pretzels and other foods that are just his so the kids are tempted to eat his stuff (still on the GAPS diet and they requested that things like that be out of site. The two fridges hold our beef, raw milk, and ferments. 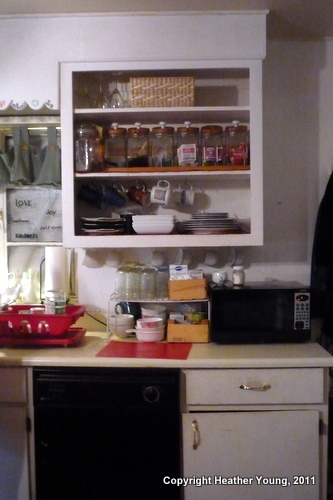 The one on the left is the regular fridge where left overs etc go, the one of the right is overflow and storage. 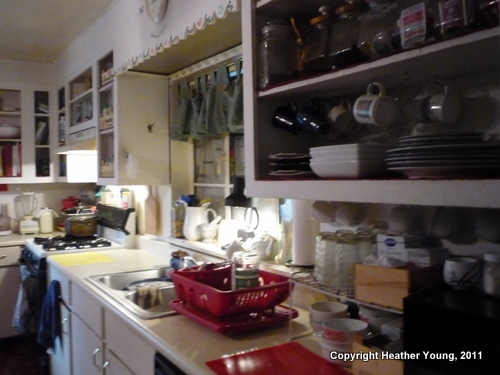 And if you are wondering…yes, I cleaned up and did the dishes before taking photos though no deep cleaning. Sorry, you, dear reader, don’t warrant a deep cleaning. I needed to clean anyway since tomorrow is Sabbath Prep so now I have one less thing to do. I love your organizing ideas. I have the same problem with using things I can’t see. Especially in my 2 fridges. Big problem there. Any suggestions?